Bellroy is an Australian company with the tagline: Considered Carry Goods. Their website fairly reeks of surf and sun. They are based in Bells Beach and Fitzroy, hence the name. Slim wallets are their differentiator, along with responsibly sourced leather and a design aesthetic that pays homage to the functional simplicity of Dieter Rams and the playfulness of illustrator Karan Singh, both of whom feature in their “journal". Their list of products is divided by the functionality that they aim to offer. Some sound real and some veer on the sappy. “Slim your wallet," makes sense, as does “merge phone and wallet", but can an accessory really help you “focus your mind", as Bellroy’s folios claim to do? The wallets come in an eco-friendly paper package with simple instructions. Each wallet, which comes in a rainbow of colours, typically holds four to 11 cards. The slimming comes from the fact that each card doesn’t get an individual slot. Instead they are stacked together with a helpful leather pullout to... well, pull out. This isn’t ideal for those who quickly need to pull out cards but it is a choice that you need to make. Slimness versus optimum access. Why do we go to parties? Well, to eat and drink of course, but also to be stimulated, to have a good time, and—at the top of the hierarchy—perchance, to be inspired. The best parties are ones that leave a memory. On a recent night, under the lingering shadows of a mango tree, a group of Indian taste-makers gathered to eat summer salads and grilled meats, drink French wines and talk about...well...that was the bad part. These were globally travelled Indians with incomes equalling those of the niche elite anywhere else in the world. The talk however was morbidly local. The problem for party hosts is that polite conversation gets boring really fast. To stand around holding drinks, smiling and talking about how bad the traffic is turns out to be the most inane of occupations. Why bother? Yet, we have all been stuck at parties, with no choice except to stick to mundane topics about movies, weather and, if all else fails, vacations. That is where the Levitating X comes in. It is effortless in its assemblage, easy in terms of functionality, and best of all, provides the “aha" moment that most seasoned party-goers and party-throwers live for. It leaves, in other words, a memory. The display is simple, and has the easy elegance of a birthday cake. The host walks out with what is ostensibly a cup on its base. The base is placed on the center of the table. The host pours a drink-- green tea, cognac, beer, coffee, it doesn’t matter which-- into the cup, pulls out the rims like a magician and voila, the cup levitates. Benumbed guests gasp and stare as this object-- full of drink and good cheer stands above its pedestal, defying the laws of gravity as it were. It stands thus, this steaming cup of Joe for what seems like endless minutes, till the first guest tentatively reaches out to take the cup. Will it fall? No. Will it topple over? No. Will it....well, no. The cup is in hand, the guest takes a satisfied sip. Et voila! With little or not effort, you have effectively elevated a cup of coffee to the realm of art. Levitating X has other such products on offer. There are plates of various sizes, sensibly made in unbreakable melamine. Ditto with the coffee cup or the drinks glasses. There is a pillow, plant and cushion. Levitating X offers fun products that add oomph to parties. These choices run the gamut of size and utility. Honestly, it doesn’t matter what you get because the point is not to be useful but to be splendidly unique. How it works is actually besides the point. But for those science buffs, it has to do with magnetic fields and how they attract, or in this case, repel each other. It is called electromagnetic suspension and uses electromagnets to stabilize objects that are floating above the base. Most design mavens talk about form and function and how they are two sides of the same coin. This product is entirely about form. Function is superfluous. Do you need a plate that levitates? No. Are you saving the world by buying a levitating cup or plate? No. Are your parties and your life enhanced by owning such an object? Undoubtedly yes. Each product category comes in an array of colors, shapes and technology. The base for example, can be wireless of with a wire hanging out by the side. Choose the wireless. It is cooler. Since you are spending this much for effect, why spoil it with a spool that comes out of the base. The shapes too are pleasing and varied. Levitating decor for example includes vases that are built like a sculpture. They are round, oval and shaped like a Buddha. The colors are black, white or coral. Custom designs too can be created. The firm’s dinnerware products include plates of different sizes. One quibble is that it isn’t intuitive to know how to center the product. At first, I thought that the black plastic rims were packing material. I almost threw them out. Thankfully, I watched the video instructions to realize that they are crucial. Without these rims, you spend a lot of time trying to center the cup or the plate on top of the black pedestal. Since the product is all about effect, or rather, the seeming effortlessness with which these objects float, you need these rims for centering the object on top of the pedestal. Each of these products are wonderful. Whether you choose the plant or the pot depends on mood and moment. Levitating X products cost in the region of $200 and are available at its website. Click here for choices, prices and shipping information. Levitating X’s products are a fun way to elevate social gatherings or for that matter, solitude. Watch the YouTube video to see how these products levitate. The best chargers are also those that multi-task. By which I mean that you can charge multiple devices without fuss. Given the number of devices that a typical person has, this means the ability to charge devices large and small-- from laptop to-- er, I am tempted to say lap-dog, but I really mean smartphone. The good news is that chargers are widely available in the market. The bad news is that most of them stink. They are a favoured corporate gift item. One that I received recently dropped its charge at the exact moment when I needed it. What is the point of being tense if your charger will hold its juice? Chargers by their very nature ought to be stress busters not stress-starters. The fantasy (or nightmare depending on your point of view) is that you can simply wave your device in the air and it will start charging itself-- that the air itself becomes so technologically advanced that it contains particles meant to charge those devices that we today view as imperitive as oxygen itself. But until such time, we need portable chargers. The reality depends on what you make of it. You can spend a couple of bucks on a charger that may or may not die at crucial moments. 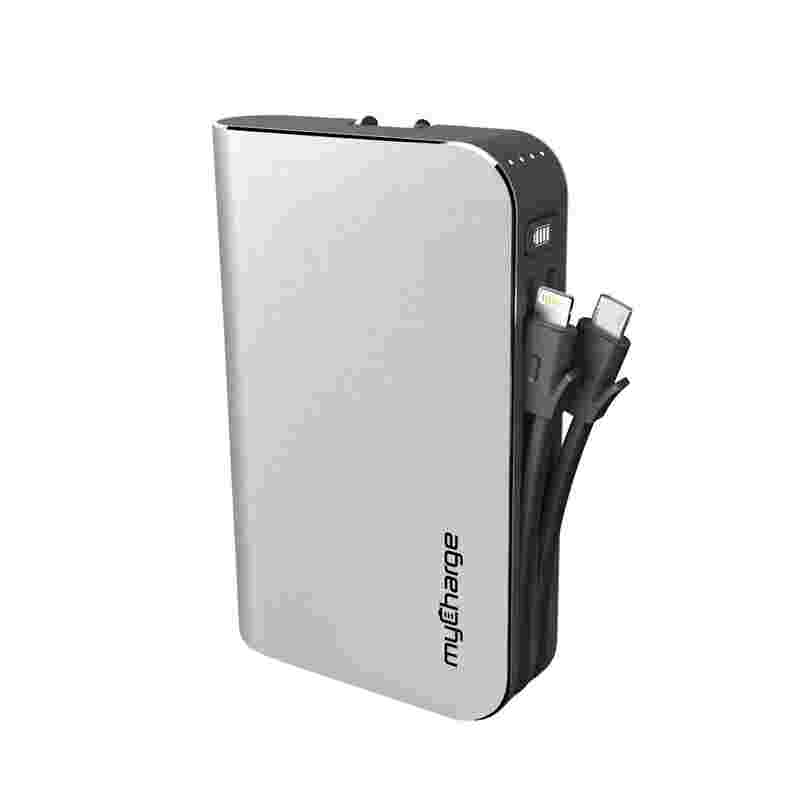 Or you can view a charger as a long-term investments that simply stays in your travel case for every trip. My Charge makes only chargers which is a plus. They hold their charge for up to a year, which means that you don’t have to remember to charge them before every trip. The products are also featured on the notoriously hard-to-get “Amazon’s Choice" list of merchants, which is a title given to “highly rated well-priced products available to ship immediately." On the negative side, there are chargers that are smaller (and cheaper) than these guys, albeit without as many bells and whistles, and you can make a case about whether you need a charger that charger multiple devices at the same time. Are you going on a trip or an adventure? Depending on that you might want to choose one of the below. Any good charger needs two things: an output (ideally more than one) and an input (ideally simply a wall plug) and a sleek design that doesn’t take too much space in your travel bag. As the ultra-specific name implies, this is really like a power generator for battery operated devices. It was designed for campers, hunters and lone rangers who lived (or wanted to live) off the grid. But it could just as well apply in India for any of us who live in towns that suffer frequent power cuts. Charge up this battery and you can run a LED television, and of course your laptops, smartphones and smart-pads. The good news is that all of these can be powered at the same time through a nifty combination of plugs into which you can feed USB and other wires. Now, for the specifications. The device comes with a 13400mAh Lithium Ion, which for those in the know, is equivalent to playing an LED television for three hours. So you could watch a long Bollywood movie, or reruns of all those old television serials that you have stacked up. It has an AC power output for the pre-bluetooth generation who actually intersect with power outlets-- and for those who want to run a compatible electric fan or electric light off of this battery. There are three USB ports: enough to charge all your devices and if you have more than three devices on the go, you need help. The power output is suitable for devices that require less than 45 watts. This means that all your old laptops that use, say 60 watts of power cannot be charged using this. Most newer models use a ridiculously low wattage: 29 watts for my Macbook Air. That said, this may not work for those Indian homes that have multiple generations using multiple generations of devices. If you are not going off the grid and just need a charger for a day-trip to Delhi, you could do worse than carry the Hub Max. It is about the size of an iPhone 7 and sleek as a mermaid. No jutting cables, no ugly wires, all neatly tucked like like a starlet who walks out of her plastic surgeon. The Hub Max has two cables integrated into its design, which is the best part in my opinion. Take your phone and toss this battery into your overnight duffel bag and you are good to go. The two cables included are an Apple Lightning cable and a regular micro-USB for other smart devices. If you have gaming devices with specialist jacks, this is not for them. Once this is juiced up, it retains its charge for up to one year, which is great for those who forget to plug in the device the night before travel. It takes about 120 minutes to charge an iPhone from zero to full charge and can do this about five times before the battery runs out. It weighs 1.19 pounds according to the company website and is a great device to carry with you when you travel next to that tiger safari or all-day board meeting. All these chargers are available at My Charge as well as online retail stores. The Hub Max is available for $99.99. The Hub Plus are available in Amazon for Rs12,419. It depends on who you are. If you trust specialists, then My Charge does, well, just chargers. They offer a range of choices depending on what type of charger you want. Size, length of charge, single or multiple devices, they have it covered. They are higher priced than your average Indian charger which is the negotiation that you need to engage in. Quality or price: that’s the question?